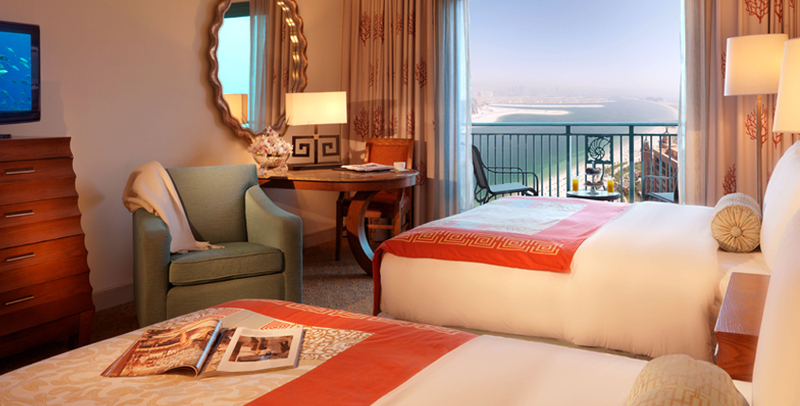 Mesmerizing views of the glittering Dubai skyline provides the backdrop for your stay inside the stylish Palm Beach Deluxe Room in Atlantis, The Palm. 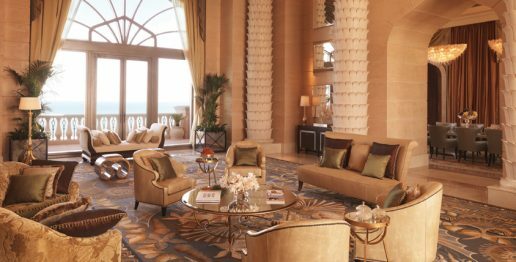 With warm tones and inviting designs, this luxurious sea-facing room captures the allure of The Palm and makes you fall in love with its spectacular views of the Arabian Sea and the Dubai skyline. Every ensuite bathroom in the Palm Beach Deluxe room offers refined luxury privileges, such as deep-soaking tub and walk-in rain head shower, to turn your stay into a sanctuary of complete relaxation. Book your stay to experience this one-of-a-kind deluxe room in Atlantis. There is comfort galore at the two-bedroom family suite of Atlantis Dubai, where a red carpet welcome is rolled out for its guests. 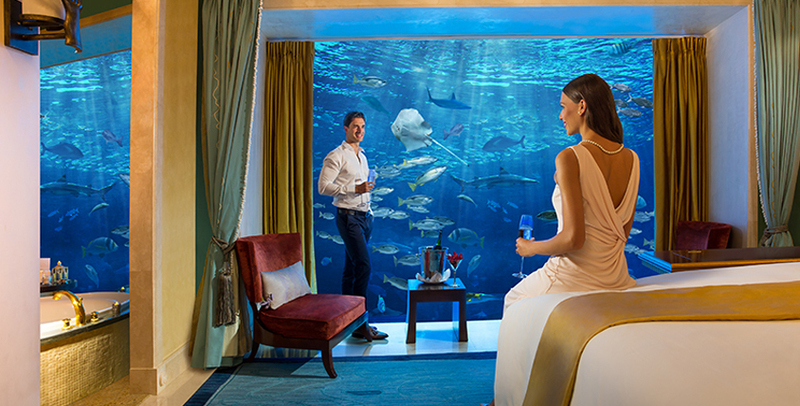 Whether you are a small group of friends on a staycation or a family looking to celebrate a special occasion, all Club Suites at Atlantis offer pure luxury for incredible value. Easily accommodating up to 6 guests (3 adults or 2 adults and 2 children, under 12), the luxurious family suite boasts a host of family-friendly features to make you feel right at home – from dedicated menus and private dining options to thoughtful personal touches by the staff as well as unique luxury concierge services, featuring a dedicated team who will take care of your every need. 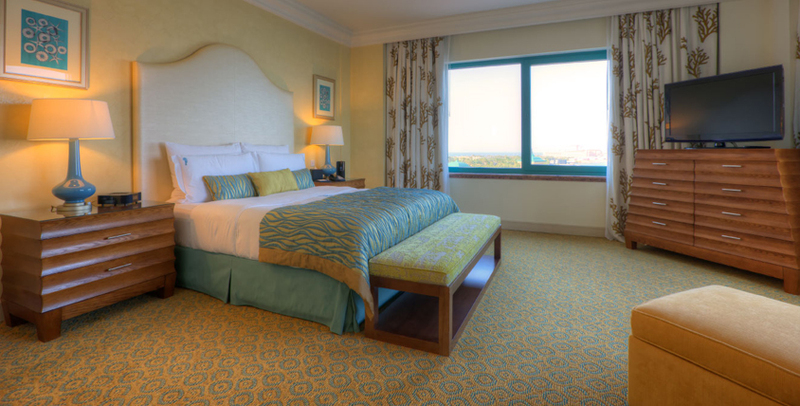 Book your family’s stay at this spacious luxury Family Suite in Atlantis. An underwater room with a surreal view of 65,000 marine creatures! Want more luxury? Then this is the suite accommodation you absolutely must experience! Take a private elevator to the spectacular three-storey luxury Underwater Suite, which is impeccably designed with inter-connecting bedrooms, a grand living room and floor-to-ceiling windows in both bedroom and bathroom that look directly into the underwater world of the Ambassador Lagoon. You can choose from two unique suite experiences – Neptune and Poseidon. Both Underwater Suites feature jetted tubs and rain showers, chic ensuite amenities such as soaps, shampoos and conditioner made with 24-karat gold as well as a 24-hour butler service on staff to make sure you enjoy every second of your stay. Living up to its namesake, the Royal Bridge Suite is something straight out of a ‘royal palace’. 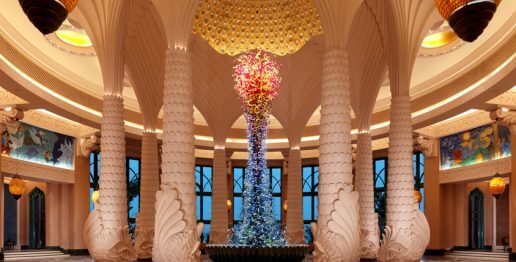 This truly unique ultra-luxury Signature Suite at Atlantis has the total wow factor to blow you away. Feel like a celebrity as you step through the entrance and be swept away by the panoramic ocean views of The Palm across Aquaventure Waterpark from the balcony. Tastefully combining refined luxury, grandeur and utmost comfort, the Royal Suite features two bedrooms with ensuite bathrooms – with walk-in rain shower, ultra- luxurious His & Hers bath vanities and free-standing baths – a full-fledged kitchen, exclusive access to The Imperial Club Lounge, and dedicated on-site butler always at hand to give you personalized attention throughout your stay. Combining all this to elevate your suite experience is The Imperial Club Lounge at Atlantis, where you can enjoy a range of exclusive benefits (worth more than AED 3,000 per day! ), including complimentary breakfast, light bites and tea in the afternoon and cocktails of your choice in the evening. 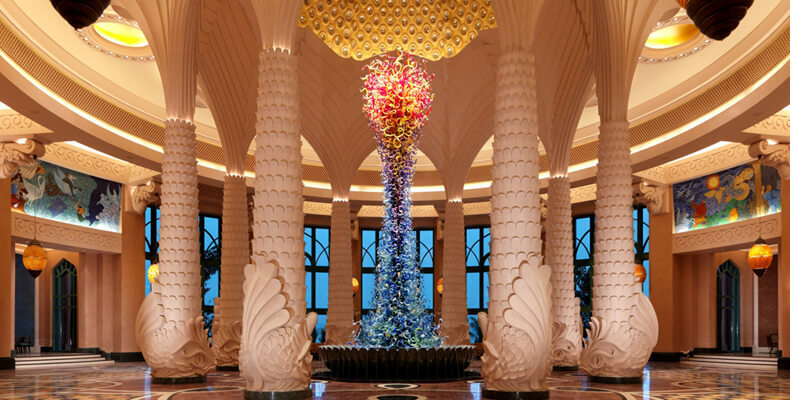 See why Atlantis Dubai is the biggest hotel on The Palm Island and discover top facts about Atlantis’ Rooms and Signature Suites. Alongside the luxury rooms and suites at Atlantis, you will also have the opportunity to indulge in a range of exclusive privileges when you book directly through the Atlantis website, including Best Rate Guarantee on your booking, bonus airline reward points, free Wi-Fi access during your entire stay, unlimited free access to Aquaventure Waterpark and The Lost Chambers Aquarium, daily access to the Atlantis Kids Club and Club Rush for a range of kids and teen’s activities, chance to dine at any of the 23 restaurants and bars onsite, personalized spa and salon treatments at ShuiQi Spa and Fitness Center, and wind down in your own private cabana at the beach. Atlantis, The Palm Offers in Dubai – Grab special discounts on Rooms & Suites and much more! 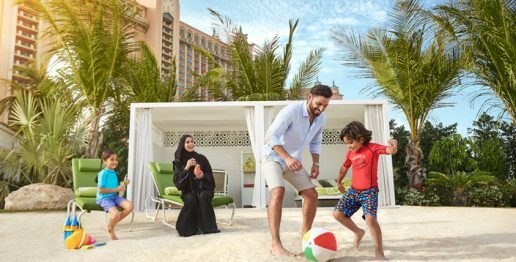 Additionally, as a UAE resident, you will enjoy 15% off on stays, up to 33% off at Dolphin Bay and up to 44% off tickets to The Lost Chambers Aquarium with the UAE Residents Special offers.